A New Marketing Plan Transforms "Downtown" into the "West Edge"
Beginning Friday, September 7, Seattleites will be asked to stop saying they are going "downtown" when visiting the Seattle Art Museum or Pike Place Market, but to say they are going to the "West Edge." That's right--thanks to a marketing ploy by the Downtown Seattle Association (DSA) and an official Mayor Schell proclamation, the area west of Third Avenue, between Belltown and Pioneer Square, has a new name. The "West Edge" is an attempt by the city and the DSA to brand a part of downtown, to make it familiar and give it an identity that Seattle shoppers can relate to. "There's nothing dull about it," says the new neighborhood slogan. "The popularity and success of branding can be seen with tangible products such as Coca-Cola or Disneyland," says DSA spokesperson Sylvia McDaniel of the name change. "More people buy into brands and become brand loyalists and, more often than not, customers for life--this is the essence of branding," she says. The "West Edge" is a place brand, a natural extension of consumer-driven marketing strategy. 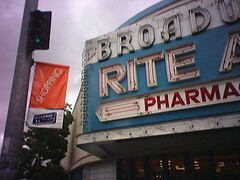 With the help of Seattle marketing firm Tip Top Creative, the DSA used focus groups, surveys, and pedestrian and merchant input to come up with "West Edge," a name that beat out other potential names like "Chenora" (the area is bordered by Cherry and Lenora), "The Stepps," and "The Blocks." "West Edge" is meant to evoke the neighborhood's geographic location and "spirited environment," according to DSA literature. Glossed over by Tip Top and the DSA, though, are the area's less marketable characteristics, like homelessness and public drug use. According to the Seattle Police Department, census figures show the area tallied 1,453 thefts and two homicides between January and July 2001, a disproportionately large number of Seattle's total. Reality aside, place branding is becoming popular across the country as a relatively inexpensive means of generating recognition for a new or lonely place in town. For example, Phoenix, in hopes of revitalizing a downtown that was never vital, named its lonely retail core "Copper Square," though nobody calls it that. In Edmonton, Alberta, downtown is called "The Arts District," though most of the art scene lies outside its borders. Such creative naming is not unprecedented in Seattle either: Lower Queen Anne has become "Uptown" in recent years, and many call south of downtown the "SODO" district. Jeff Stuhmer, another DSA spokes- person, hopes the West Edge name will help those in the neighborhood feel connected through a common identity. But just like Pepsi's "Choice of a New Generation" campaign, the DSA branding philosophy is mostly about money. The hope is that shoppers will think about the West Edge like a brand, and eventually a favored shopping destination. But will it catch on?